In 2013 and 2016 CWM Europe partnered with the Protestantse Kerk in the Netherlands and the Sozialwissenschaftliches Institut of the Evangelischen Kirche in Deutschland to bring together thinkers and leaders from churches in Europe that are considering the future of Protestantisms in contemporary society. In Wittenberg we also worked together with the Evangelische Akademie. If Protestantism is to find new relevance in our European contexts then we have to re-imagine and reform our understanding and practice as Protestants. 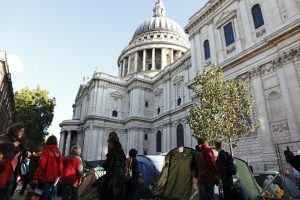 The metaphors of “tent, temple and public square” help us to look at the dynamics of institution and movement to explore the contributions Protestantism(s) can make to our secular, postmodern and liquid societies. The conference “Liminal Protestantism” was organized in April 2013 in Doorn in the Netherlands. The conference “Re-imagining Protestantism” was organized in April 2016 in Wittenberg in Germany. The Reformation was a movement that brought renewal and reform and calls its inheritors to continue that renewal and reform in their own time and context. If Protestantism is to find new relevance in our ‘secular, postmodern and liquid’ European contexts then we have to re-imagine and reform our understanding and practice as Protestants. Drawing on metaphors of “tent, temple and public square” the consultation looked at the dynamics of institution and movement to explore the contributions Protestantism(s) can make to our societies. We discussed examples of renewal and fresh patterns of church that are taking place in different European countries to see what we can discover from their experiences.